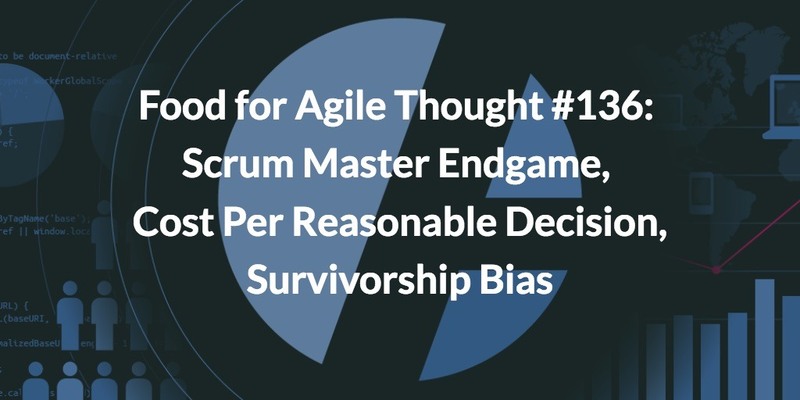 Food for Agile Thought’s issue #136—shared with 16,018 peers—focuses the scrum master endgame or: when is it time for the coach to look for a new team? We also learn why scrum and DevOps are practically made for each other, that we need to focus more on the cost of decision making, and how the unconscious application of a mental model may lead you in the wrong direction on your quest for product/market fit. Tristan Kromer: 32 Steps for Corporate Innovation...you won’t believe what happens next! Tristan Kromer reveals his one-size-fits-all corporate innovation methodology—from metered funding for the accelerator to visiting Silicon Valley. Source: 32 Steps for Corporate Innovation...you won’t believe what happens next! A sprint planning checklist? How dare you: Scrum is a mindset, not a methodology. It is a journey, not a destination. There is no one-size-fits-all-and what else could you possibly cover with a checklist, the mother of all standardized processes? Well, it always depends on the purpose of a tool's application. Read more why scrum checklists are a handy tool if applied at an operational, hands-on level, reducing your cognitive load and freeing up time for more relevant things. Read More: The Scrum Sprint Planning Checklist. Chris Murman: When Is Your Team Ready To Leave The Nest? The scrum master endgame: Chris Murman applies the law of diminishing returns to coaching our teams, programs, and leaders: when is it time to move on to another team or organization? Source: When Is Your Team Ready To Leave The Nest? Joshua Partogi believes that DevOps is not merely for the tooling of the CI/CD pipeline but integrates well with Scrum. Download your invitation: Webinar #1: Product Discovery Anti-Patterns — April 10th, 2018. John Cutler challenges you to figure out how much resources your decision process absorbs, moreover, whether it is worth its costs. Patrick Woodhead points at a mental model that may lead you astray from discovering what is worth building. Read more: Food for Agile Thought #135: Agile Ecology, Product Hardship, DevOps Science, Corporate Product Death Cycle.